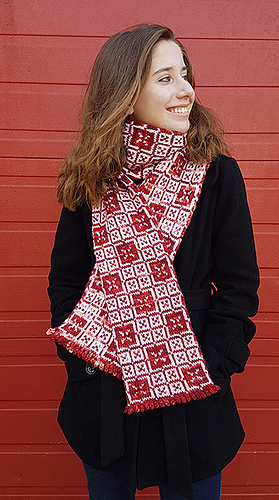 This reversible scarf is double-thick, over six and a half feet long, and will definitely keep you toasty in freezing temperatures! Moreover, it’s knitted completely in the round and the only sewing required is a single 7”-long seam at the end. You can also easily customize the length by working either more or fewer chart repeats. The scarf takes its inspiration from the background motif of the initial letter “D” on ‘The Anointing of David’. This is one of the 250 pages of the Macclesfield Psalter, which was created around the quarter-mark of the 14th century in East Anglia.